Dale, Ronald J.. "Fort George National Historic Site of Canada". The Canadian Encyclopedia, 06 December 2016, Historica Canada. https://www.thecanadianencyclopedia.ca/en/article/fort-george-national-historic-site-of-canada. Accessed 20 April 2019. Fort George National Historic Site and Battlefield of Fort George National Historic Site in the town of Niagara-on-the-Lake, Ont, were designated in 1921 by the Historic Sites and Monuments Board of Canada. Fort George is a reconstruction of the principal fortification of the British on the Niagara Peninsula during the War of 1812. The Battle of Fort George on 27 May 1813 led to its 7-month occupation by American forces. Fort George was commemorated with a bronze plaque on a stone cairn in 1930. During the height of the Great Depression, the fort was reconstructed and refurnished to its 1812 appearance. The large fort with its 6 earthen bastions and strong palisade features 7 reconstructed buildings and the restored stone powder magazine. Heritage interpreters, dressed in the uniforms of the period, provide tours and living history demonstrations. Performance displays of musketry, artillery firing, and fife and drum music, transport visitors back to this dramatic period. Parks Canada administers the site. The cairn commemorating the battle of Fort George (a plaque was added in 1923) marks the northeast corner of the battle site. It is located about 3 kilometres northwest of Fort George, near the shore of Lake Ontario on the northwest end of Queen Street. The main battlefield is not open to the public. The British army began building Fort George in 1796 on the banks of the Niagara River after they were forced to abandon Fort Niagara in New York by the terms of Jay's Treaty. Completed in 1799, the fort was the headquarters of the British army and the British Indian Department in Upper Canada, and protected the vulnerable Niagara Portage route, the main route between Lakes Ontario and Erie. 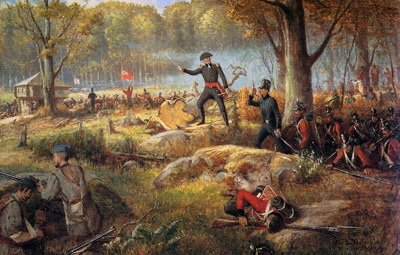 When war broke out, the British army in Upper Canada was under the command of Major General Isaac Brock. From Fort George, Brock led a force of regulars and militia to Fort Amherstburg (see Fort Malden National Historic Site) and launched a successful attack on Detroit. On 13 October 1812, he was killed at the Battle of Queenston Heights during which an invading American army was defeated. Brock was buried in one of Fort George's earthen bastions (his remains were later moved to Brock's Monument). 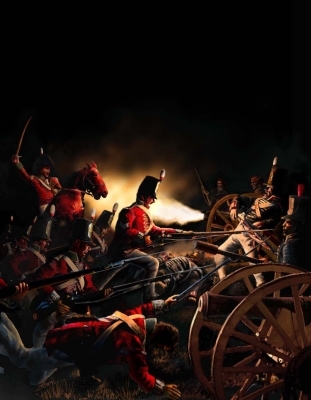 On 25 May 1813, the Americans at Fort Niagara, only 700 metres from Fort George on the American side of the Niagara River, bombarded the Canadian shore with heavy artillery, destroying all of the buildings in Fort George except for the stone powder magazine. Two days later, an American army of 5000 launched an amphibious invasion against the town of Niagara, overwhelming its 1100 defenders. They refortified the ruins of Fort George, occupying the fort and town. 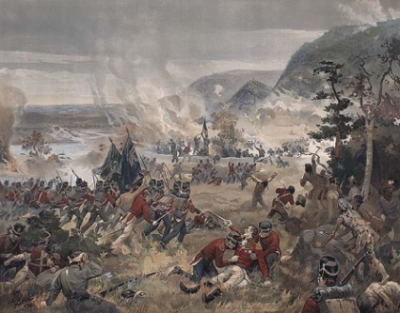 The American plan had been to use Fort George as a bridgehead from which they could launch an attack on the British base at Burlington Heights (now in Hamilton), forcing the British to abandon a large part of Upper Canada. However, American defeats at the battles of Stoney Creek and Beaver Dams in June 1813 dashed these plans. While they occupied Fort George, American forces could not venture much beyond its defences without being ambushed by British regulars and First Nations allies who kept up a loose siege of the American position. Finally, on 10 December 1813, the Americans retreated from Fort George, burning the town on their departure. The British reoccupied the fort and on 19 December, they captured the American Fort Niagara and held it for the rest of the war. In the spring of 1814, they began rebuilding Fort George while constructing a new strongpoint, Fort Mississauga and a new depot, Butler's Barracks, nearby. While an American army threatened the British in July 1814, Fort George was never attacked again. After the war, the British gradually shifted their garrison to Butler's Barracks and Fort Mississauga, finally abandoning Fort George by the early 1830s. The buildings were allowed to decay into ruin, the earthworks were overgrown by shrubs and the ditches filled up with debris. Carl Benn, The War of 1812 (1991); Gilbert Collins, Guidebook to the Historic Sites of the War of 1812 (1998, revised 2006); E.A. Cruikshank, The Documentary History of the Campaigns on the Niagara Frontier, 1812-1814, 8 volumes (1902-08); Ronald J. Dale, The Invasion of Canada: Battles of the War of 1812 (2001); J. Mackay Hitsman and Donald E. Graves, The Incredible War of 1812 (1999); Robert Malcomson, Capital in Flames: The American Attack on York, 1813 (2008). BLOCKADE OF FORT GEORGEA detailed account of the 1813 blockade of Fort George in the War of 1812. From the Niagara Historical Society.